They are the creator of the discussion. There are no replies to the discussion. Note: Once a discussion is closed for comments, only instructors can re-open it. In Group Navigation, click the Discussions link. The group discussions index page is very similar to the course discussions index page. 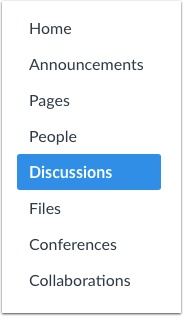 It will display an icon overview of each discussion and whether or not the user is subscribed. Green discussion icons indicate a subscription to the discussion. Locate the Options icon  and click the Close for comments link . Verify the discussion is closed for comments by locating the This topic is currently locked indicator. Previous Topic:How do I create a discussion in a group? Next Topic:How do I manage groups as a student group leader? Table of Contents > People and Groups > How do I close a discussion for comments in a group?